"We will not support any front," Gandhi, who was campaigning in his constituency, told reporters. Rahul Gandhi on Saturday ruled out support to the Third Front to form the next government, putting the lid on speculation about likely post-poll arrangements to keep the BJP out of power. He also promised voters in Amethi that should the Congress return to power, every poor Indian would get a home and free treatment in hospitals, and every senior citizen a guaranteed pension. “We won’t support any front. Koi jod-tod nahin karenge. 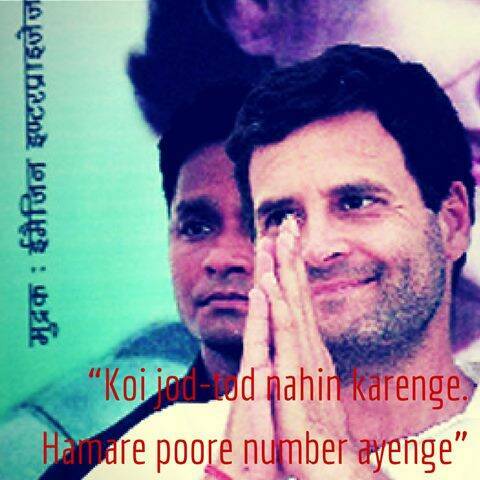 Hamare poore number ayenge,” Rahul told reporters in response to questions after his third maha-chaupal in Amethi. Congress leaders Salman Khurshid and Prithviraj Chavan were said last week that their party could consider taking the support of, or backing the Third Front to form the government. On Friday, CPM general secretary Prakash Karat said that a repeat of 1996 was possible, and the Congress might be forced to support a “secular” government to block the BJP. Samajwadi Party leaders have been claiming that they would get Congress support to form a Third Front government. Speaking at Deeh block where he held one of his three maha-chaupals, Rahul listed three key elements of the Congress’s vision if it was voted back. “You told us you don’t have a roof above your heads and asked for something along the lines of Food Security and MGNREGA. You said only a handful of houses under Indira Awas Yojana reach a village. Now, the government will build houses as per requirement; if the UPA government comes to power, we will put a roof over the head of every poor person in all villages and cities. “Third, we want to guarantee every senior citizen from every state, religion or caste a pension,” Rahul said. The Congress vice-president attacked the BJP’s prime ministerial candidate Narendra Modi over his government’s alleged illegal surveillance of a woman. “In Delhi I see posters of Modiji which read ‘I will empower women’. Arey bhaiyya, there is no need to empower women, they are already powerful. You should just give them some respect. But you don’t,” Rahul said. He continued to attack the Gujarat model, accusing Modi of gifting land cheap to the Adani Group. Rahul repeated his sister Priyanka Vadra’s statements about the special bond their family shared with Amethi, and the promise that they would not, unlike the candidates of rival parties, leave the constituency to its fate once the election was over. He also stressed the alleged differences in the language and manner of speaking of leaders of the BJP and Congress, saying “we speak with love and respect even when we talk of the opposition”. Like Priyanka, he spoke of their father Rajiv Gandhi, and recalled his visits to the constituency with Rajiv as a boy. “I share a bond with you; it is a bond of hearts and love, it is not a political bond,” Rahul said.